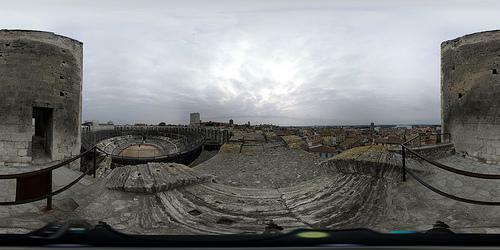 The Roman Amphitheatre Arenes d'Arles is one of the major attractions in the city, dating back to 90 AD. The Roman Amphitheatre Arenes d'Arles is one of the major attractions in the city, dating back to 90 AD. It is part of the UNESCO World Heritage Site of Roman and Romanesque monuments of Arles as an example of the adaptation of an ancient city to medieval European civilization. The 2-tiered had a seating capacity of 20,000 who came here to witness gladiatorial fights and chariot races. It was modified into a fortress with 4 towers after the fall of the Roman Empire in the 5th century, encompassing 200 dwellings till the 19th century. Today it hosts various courses camarguaises (bloodless bullfighting) as well as plays and concerts in summer.